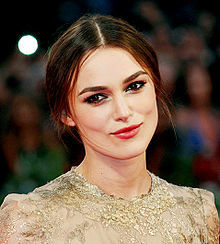 Keira Christina Knightley (born 26 March 1985) is an English actress and model. She began acting as a child on television and made her film debut in 1995. Knightley had a supporting role as Sabé in Star Wars Episode I: The Phantom Menace (1999) and her first significant role came in The Hole (2001). She gained widespread recognition in 2002 after co-starring in the film Bend It Like Beckham and achieved international fame in 2003 as a result of her appearances in the Pirates of the Caribbean film series (2003–2007).